The Start Digging Out Of Credit Card Debt Challenge - Week Three. The Start Digging Out Of Credit Card Debt Challenge – Week Three. So last week you were supposed to leave your comfort zone and start calling the credit card companies. I got several emails from readers saying that they did it and got reductions on their interest rates…did you? They were talking about being nervous, scared, shaky…but after it was over and they knew they made some headway, it was pure elation. I hope you took some time over the last 7 days to getting your interest rate reduced, which in effect reduces the debt you owe as well. If you did, congrats for breaking down that barrier and calling them up. That’s great! If you don’t already have this stuff written down, you better get going! In this example, we have 3 credit cards with different balances on it. As I mentioned before, the snowball method can be very effective in getting rid of debt and I agree with it. I even agree with paying off the card with the lowest balance first rather than the one with the highest interest in order to gain a psychological boost by paying off a card quickly. But here is where my version changes..we are going to make 2 payments a month to the card with the lowest balance. Huh? How do you do that? The Citibank card has a minimum payment of $150 per month. The Chase card has a minimum payment of $95 per month. The Capital One card has a minimum payment of $200 per month. Since the Chase card has the lowest balance, that is the card we will concentrate on getting rid of first. So on the Citibank and Capital One card, continue to make the minimum payment each month when it is due. Easy enough, right? You have been doing that all along, just keep doing it. But on the Chase card, we are going to make 2 payments a month equaling more than the minimum balance. The minimum on this card is $95 per month…but how much can you afford to pay? Remember, we are trying to get out of debt here and we need to stretch our money now in order to get rid of it. So let’s say you can put $200 per month towards the debt. $95 for the minimum and $105 extra from canceling your cable and not eating out as much. And let’s say that the minimum is due on the first of each month. But instead of sending them $95 on the first, you are going to send $100 twice a month, and both payments are going to arrive before the due date. Doing so makes paying $200 a little easier to swallow because it is broken into 2 payments over the month instead of one big payment when the bill is due. And by using online banking, you can schedule these out so that both payments arrive before the due date. You can send the first one on the 15th and the second one on the 27th, or some combination that makes you comfortable. The key is to make sure the both get there before the due date! Splitting the payment into 2 may seem like a headache, but it really is not all that hard to manage and it lessens the damage to your checking account (and mental state) because it spreads it out. The key to using this method is to continue sending the amount that you can, twice every month, until this card is paid off. If the minimum payment goes down, do not reduce your bi-monthly payments…keep them exactly the same. In a few months the monthly minimum might drop to $80, but you are going to continue sending $200…or $300…or $350, the most that you can possibly spare. $350 sound high? Sure it does as a once a month payment, but does $175 every two weeks sound as bad? Sure doesn’t anymore! So while you continue to pay the minimum on the 2 other cards as normal, set up the twice-monthly payment for as much as you can possibly bear. It SHOULD hurt…you want to get out of debt. But imagine how great it will feel when one card is gone…2 cards are gone…all of it is gone! And as soon as that first card is paid off, you are going to take whatever you were paying twice a month and apply it to the card with the next lowest balance and turn that one into a bi-monthly payment as well. The next card on the list is the Citibank card and we said the minimum payment was $150, which you have been paying all along. But now that the Chase card is paid off, we are going to add the amount you were paying to it ($200?) to the payment to Citibank. So your monthly payment to Citibank is now going to be $350, but we will split it into 2 payments of $175 delivered prior to the due date. Rinse. Repeat. Over and over. 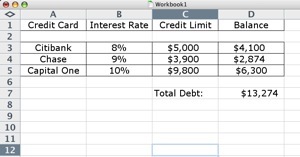 I hope this method makes sense to everyone, as I used it to get out of debt myself. With online banking it is incredibly easy to manage. With checks it can still be done but it takes a little more work to maintain it. Next week I will check in with how everyone is doing, answer the emails I get during the week, and discuss other strategies for cutting some costs to free up a few bucks to put towards this debt. Let me know if you have any questions or comments and I will do my best to answer them. Good luck and get cracking to get out of debt! Yay I already do this sort of, except I make a bunch of payments every month every time I free up some cash. lol. Yay online banking :). However I think I might re-evaluate a little bit and see if I can raise my “standard” payment (more than the minimum) a little bit and break it into two payments instead of one, you are right it would hurt less that way. Instead of always paying at least $200 (my minimum is $117 at the moment) and then snowflaking extra cash as I get it, maybe I can pay 2 payments of $125 each and continue to snowflake as I free up extra cash from selling things etc. Hmm. Maybe $110 each. Baby steps lol. Sounds like a plan, glad I could help! Isn’t this the plan behind bimonthly mortgage payment plans? I’m sure it is, but since I don’t have a mortgage…if I did, I would do them that way too! There are many different ways to reduce credit card debt and many will argue for what they think to be the “best” or “most effective”, but as long as your moving in the right direction and your balances are going down, whatever works “best” for you is the most “effective”. must. get. on. this. two. week. plan. You’re making this just too hard sir. AND I disagree with the online banking theory for folks in debt up to their eyeballs. In my humble opinion, getting out of debt is a mind-set change. Folks are dealing with THAT issue the first few months to a year. You are, of course, welcome to your opinion. But based on all the emails I have been getting, some people find this works great. Thanks for the comment. I like this blog. It inspires me to comment. I am also in debt up to my… maybe not eyeballs. Maybe my teeth. Not everyone in debt got there the same way and for the same reasons. Different strokes for different folks. And I continue to pay off big chunks of debt with the magic of online banking. 😉 Seeing everything in numbers on my computer screen works better for me than writing a paper check and forgetting to mail it. We all have to find our way. This is just one of them. Yay my first time being thought of as a bot. A milestone! I hope the following information may be of some assistance. ASIC (The Australian Securities and Investments commision) has a consumer website called FIDO (www.fido.gov.au). In the publications and resources area they have a link to some calculators. They have a credit card calculator (which is a downloadable excel file). This calculator shows you how long it would take to pay off a credit card, and how much interest is paid, by just paying the minimum payment. It also shows you how much interest and time you would save by increasing your monthly payment above the minimum payment. This can be a real eye opener. I get paid every two weeks and make a payment from each pay that is the card minimum.